President Muhammadu Buhari on Friday decorated brave war heroes with a Purple Heart medal, an award given to troops who fought for six months under ‘Operation Lafiya Dole’. The decoration of the soldiers took place in Yola, during President Buhari’s visit to the State. President Buhari, on arrival, was received at the Yola International Airport by the Governor of Adamawa State, Senator Mohammad Umaru Jibrilla, the Speaker of the House of Representatives Yakubu Dogara and other dignitaries including a former Vice President, Atiku Abubakar. The President inspected a guard of honour by the 23rd Armoured Brigade of the Nigeria Army after which he was invited by the Chief of Army Staff, Lt. General Tukur Buratai, to present the medals to the wounded soldiers. 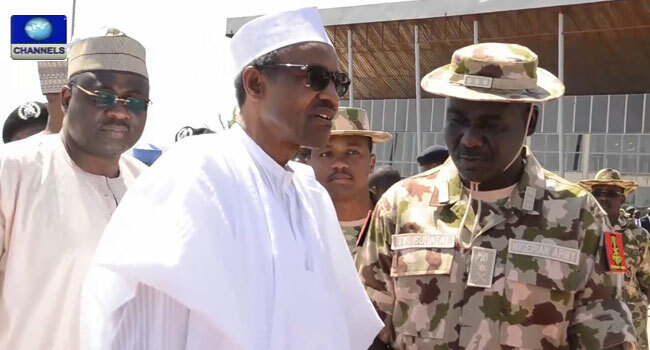 After decorating the soldiers with the medals, President Buhari expressed his confidence on their ability to end the activities of Boko Haram terrorists in the oil-rich nation’s north-east. After the medal presentation, the President visited the Malkohi Internally Displaced Persons (IDPs) camp in Yola in the southern part of Adamawa State. He told the IDPs that the Boko Haram terrorists do not represent any religion, stressing that the terror group is set to disintegrate Nigeria. President Buhari described the condition of the IDPs as unfortunate and called on them to remain calm, as the government was working towards returning them to their homes. The President said: “The government is proactive about rebuilding your Schools, hospitals and homes”. The chairman of IDPs in Malkohi IDPs camp, Mr Nicholas Samuel, thanked the Federal and State governments for coming to their aid and appealed to the President to facilitate their return to their homes. Governor Jibrilla had earlier told the President that one of the major concerns of the State government was the welfare and wellbeing of the displaced persons. The Director General of the National Emergency Management Agency (NEMA), Mr Sani Sidi, told the President that at present, the camp had 80 pregnant women and 175 unaccompanied children.